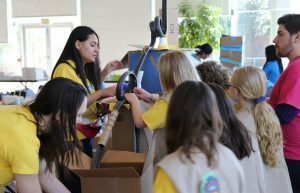 More than two dozen members of the Girl Scouts of Central Maryland came to Johns Hopkins University’s Homewood campus Saturday to design and build miniature roller coasters out of cardboard boxes, pipe insulation tubing, cups, tape, and other household materials—and to learn about the field of engineering along the way. The elementary- and middle-school-age Girl Scouts were challenged to construct 5-foot roller coasters that incorporated as many “thrill” elements as possible—tunnels, hills, banked curves, vertical loops, helixes, in-line twists—and then to transport marbles through the contraptions. Sridevi Sarma, associate professor of biomedical engineering and associate director of the Institute for Computational Medicine, hosted the event as part of L’Oréal USA’s Changing the Face of STEM Mentoring Grant, which she received in September. To ensure the event stayed on track, nine female Johns Hopkins engineering students guided the girls through the design process from brainstorming to realization. Each team, organized by troop number, worked within an allotted timeframe to build the fastest and most creative coaster. “We’re working as a team and having fun, all while learning how to be an engineer and build things,” said Malai Bowman from Troop 736.